Hotel Vernet is located just 100 metres from Avenue Champs ElysÃ©es and George V Metro Station. It offers spacious rooms and suites with free Wi-Fi internet access and a minibar. Decorated with modern fabrics, natural colours and wood furnishings, the rooms at Vernet are contemporary in style and offer a safe and a TV. The private bathrooms feature a bathtub and the extra comfort of bathrobes and slippers. Featuring an impressive glass dome designed by Gustave Eiffel, the restaurant offers traditional French bistro food. Guests can also enjoy a drink in the hotel's lounge. Additional facilities include private parking onsite with a valet service and a 24-hour reception. Local transport, including George V Metro Station, offers direct access to Le Louvre and the Bastille Opera. 8th arr. is a great choice for travellers interested in Luxury Brand Shopping, Shopping for accessories and Seafood. Guests who stay in this area will also find a number of great bars and restaurants nearby. 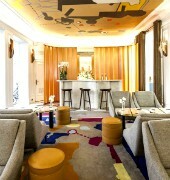 The VERNET PARIS is a Tourist, Traditional, Business, Boutique, City hotel, Honeymoon, Full Service hotel. Located in City Centre - Champs Elysees area. Shopping is within walking distance and the nightlife/restaurants are within walking distance from the hotel. Descriptionclass="small" style="text-align: justify; font-size:11px;">Hotel Vernet is located just 100 metres from Avenue Champs ElysÃ©es and George V Metro Station. It offers spacious rooms and suites with free Wi-Fi internet access and a minibar. Decorated with modern fabrics, natural colours and wood furnishings, the rooms at Vernet are contemporary in style and offer a safe and a TV. The private bathrooms feature a bathtub and the extra comfort of bathrobes and slippers. Featuring an impressive glass dome designed by Gustave Eiffel, the restaurant offers traditional French bistro food. Guests can also enjoy a drink in the hotel's lounge. Additional facilities include private parking onsite with a valet service and a 24-hour reception. Local transport, including George V Metro Station, offers direct access to Le Louvre and the Bastille Opera. 8th arr. is a great choice for travellers interested in Luxury Brand Shopping, Shopping for accessories and Seafood. Guests who stay in this area will also find a number of great bars and restaurants nearby.